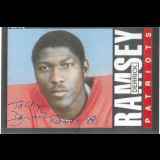 Derrick Ramsey is a former professional American football player who played tight end for nine seasons for the Oakland/Los Angeles Raiders, New England Patriots, and Detroit Lions. He was a quarterback and tight end at the University of Kentucky, where he was part of the team that won the 1976 SEC Championship and the 1976 Peach Bowl. He was first team All SEC and third-team All-American as QB in 1977 when Kentucky finished with a 10-1 record and #4 ranking in the final AP poll. Ramsey also played two games on the basketball team as a walk-on in 1976. He currently is the Athletic Director at Coppin State University.